Eye-ssential for Tired, Puffy Eyes, Tender Brows and Aching Heads. Even after a restful night's sleep you can wake with red, puffy eyes that make you look and feel tired –especially during allergy season. 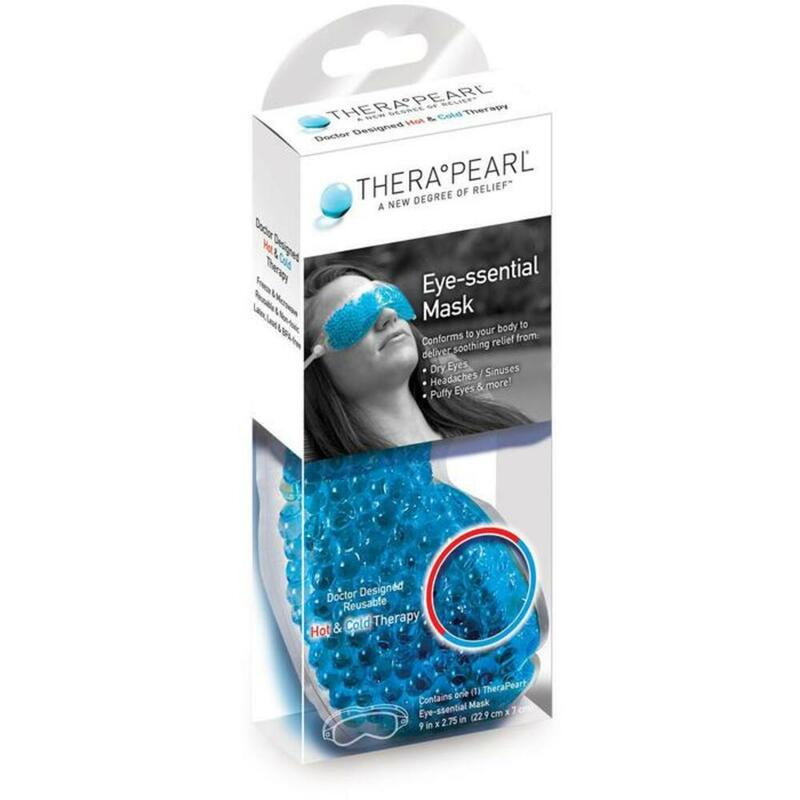 If decongestants leave you in a fog, try THERA°PEARL's Eye-ssential Eye Mask, the natural way to look and feel brighter every day. The mask can be used cold or hot. Cold relieves dry, puffy eyes and those wicked sinus headaches. It takes the sting out of a brow wax and reduces swelling after a cosmetic procedure. Heat helps to reduce nasal congestion and relieves soreness once the swelling is gone. Great for Professional Use and Retail. Chill it in the freezer or fridge or pop it into the microwave. Place it over your eyes and sinuses, or slide it up to your forehead. Its pliable, face-hugging shape stays put without drips or leaks, and the therapeutic temperature lasts 20 delicious minutes. You won't believe the comfort. This body-hugging shape doesn’t leak or drip during use. Independent lab results also prove that TheraPearl is non-toxic, so there is no threat of VOCs, heavy metals, or BPA. THERA°PEARL Pack should be applied to skin for doctor recommended time of 20 minutes. Remove and wait at least 20 minutes. Reapply pack for 20 minutes, if needed. HEAT THERAPY - Microwave for time indicated below and test pack temperature. Heat for additional 5 seconds as needed until desired temperature is reached. 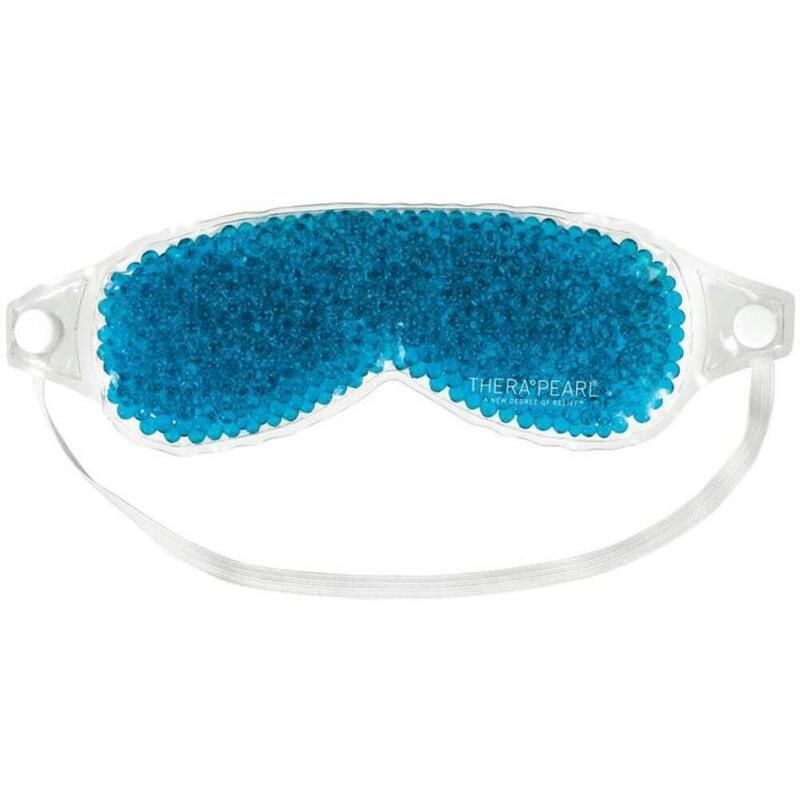 WARNING: Although the manufacturer says you can use the Eye Packs for heat therapy, Pure Spa Direct very strongly recommends AGAINST IT. Eyes are very sensitive. The Pearl Technology® contained in every THERA°PEARL pack is game changing innovation born of an age old therapy. Crafted by a doctor who knew she could offer her patients something better than a bag of frozen peas, THERA°PEARL was designed with you in mind. Whether chilled or heated, Pearl Technology conveniently holds its temperature for the doctor recommended time of 20 minutes and conforms to your body to deliver the perfect relief from your aches and pains. Easily pliable when frozen, our Pearl Technology is cold enough to offer targeted ice therapy without sacrificing flexibility. Not stiff, jagged or uncomfortable, chilled THERA°PEARL packs stay smooth and soft on your skin as they conform to deliver soothing relief. When conveniently heated in a microwave, the Pearl Technology in your THERA°PEARL pack is the perfect solution to relax stiff muscles and encourage blood flow and healing. Delivering consistent heat therapy directly to your desired relief area without a mess, the reusable packs are combination therapy in one convenient product. At THERA°PEARL, we recognize it’s all about giving people the opportunity to see and interact with our product. When they do, they love it. Unlike other products, our high quality clear packaging showcases the product inside, and our poke hole allows people to feel the difference for themselves. The distinct ornamental appearance of our pearls is our trademark, and it’s how consumers recognize our product in stores. THERA°PEARL is the doctor-designed, drug-free way to relieve pain and inflammation. THERA°PEARL packs use innovative Pearl Technology® that absorbs and delivers heat & cold for the doctor recommended 20 minutes of highly effective therapy. Their dual action provides twice the therapeutic benefit in a single pack: start with ice to reduce swelling and bruising, then switch to heat for penetrating pain relief. What are the benefits of ICE therapy? Ice therapy (a.k.a. cryotherapy) is one of the most common recommendations by doctors for injury prevention & recovery. Applying ice immediately after an injury or physical trauma (the sooner the better) constricts blood flow & slows bleeding/swelling. Ice therapy reduces pain & muscle spasm. Also, applying ice to the injured area decreases the metabolic rate of cells, which limits the risk of cell death after an injury and helps prevent long-term damage. You want to ice during the first 24 hours following an injury, when there is evidence of swelling and/or bleeding. Even if you don’t have an “injury,” it’s recommended to apply ice after any physical activity to lessen the effects of wear & tear on the body. What are the benefits of HEAT therapy? Heat therapy increases circulation (blood flow), effectively relaxing muscles & easing movement. Stimulating blood flow to injured areas once swelling has gone down promotes healing & speeds recovery of damaged tissue. TheraPearl Hot & Cold Packs. It's Ice. It's Heat. It's Smart Relief. Therapearl hot and cold packs. These Hot/Cold therapy packs were designed by a renowned doctor for patients in her practice to combat the inflammation of minor surgery.